This is, without a doubt, one of the most awesome postcards I've ever received. 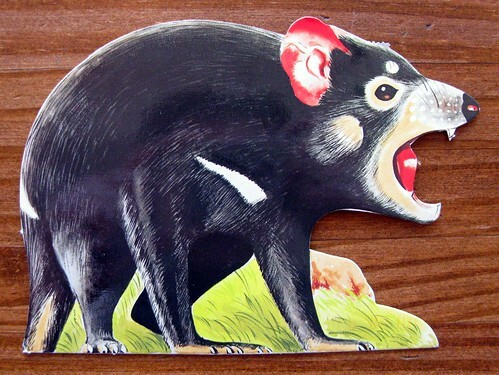 It's a die-cut Tasmanian Devil, which of course came to me from Tasmania in Australia. The sender also blogged about it, (and isn't she adorable standing next to that postbox?) and in an unplanned ironic continuity from yesterday's post, she also showed it going into a postbox! She shows a photo of its little fang biting a finger, and there must be some kind of allure about the little fang, because my beloved did the same thing when he picked up the postcard - tested out the sharpness of the wee fang-let! He was appropriately awed that the fang survived its journey from Australia... in fact this postcard arrived in beautiful shape, sharp fang and all. 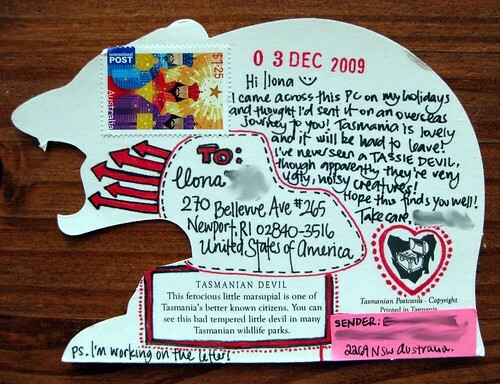 This very artistically talented pen pal makes all her mail beautiful, even the back of a little postcard. I love what she can do with just red and black ink designs. Hooray for funky postcards from faraway lands! UPDATE 1.7.2010: Someone used the front photo as an image for their article on Tasmanian Devil Facial Tumors. Wow. I recieved a while back a postcard from England which had one of those 3d effects on it. If you moved it the picture on it moved. I still have that card. What I know about tazz devils they are very cute but vicious. They do attack even each other. Some times the baby ones will attack their mother driving her out.So while they look cute and cuddly they are mean creatures with a bad temperment. oh my gosh i love it awesome and creative . Thanks for sharing and posting with it . Best postcard EVER ! ! ! you are sooo right BEST postcard EVER!!!! Way cool! that is a great postcard. a little local flavor and cute!